S100 has been the premiere name in motorcycle care for over twenty years. Since their importation from Germany in 1984, they’ve taken the American motorcycle community by storm with their easy-to-use, incredibly effective line of motorcycle wax, metal cleaner, chrome polish, wheel cleaner, and detailing supplies. The difference between S100 motorcycle cleaners and other products on the market is the synthetic detergent-based cleaning agents. Prior to S100, all cycle cleaners were made with lye or acid. These ingredients may remove some grime, but they leave white stains on metal. Degreasers will provide more cleaning power, but they are detrimental to plastic, rubber, and vinyl. S100 motorcycle products contain none of these ingredients or harsh solvent, and they actually perform better than the competition. Bikers took notice and S100 has been leading the pack ever since. Everything you ever need to clean and protect your bike’s finish is in this kit. One-step complete cycle cleaner - just spray on and rinse off! 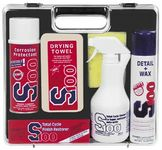 S100 Total Cycle Cleaner 1 Qt.